Every element in the ESPN photo shoot has a specific function, even if the end result is just a few pictures — just like every jump shot over the summer has a purpose, even if the end result is just one critical basket. 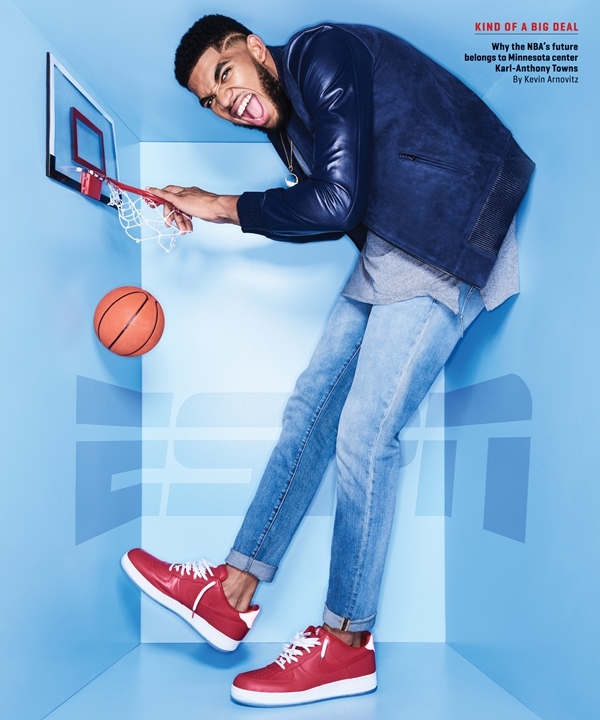 Video (02:46) : We go behind-the-scenes with Timberwolves star Karl-Anthony Towns during his magazine cover shoot with ESPN. It’s Wednesday, Oct. 5. Timberwolves star forward Karl-Anthony Towns got his hair cut less than 24 hours ago by his barber, Akeem Akway. He cuts hair for a lot of athletes in the Twin Cities at his shop in Spring Lake Park, including Tyus Jones and Anthony Barr; for Towns, Akway comes to him. Akway is one of more than a dozen professionals on site for Towns’ ESPN The Magazine cover photo shoot, which accompanies a lengthy article in the issue that hits newsstands later this week. As a working guest invited to watch the process unfold, I’m struck by the attention to detail — though given what we know of Towns’ already-stated quest for greatness, perhaps it’s not all that surprising. Towns — who turns 21 today – is ready for his close-up. Brandon Williams — Towns’ personal stylist — is here from Los Angeles with an entire rack of clothes for the shoot. Peter Yang is also here from Los Angeles to take the pictures, a process that will take several hours. ESPN has a makeup artist on-site. Production assistants are inflating basketballs, just in case. The fake trees and clouds that Towns will pose with have already been specially made. Williams, who is busy steaming Towns’ clothing options, explains his role. Like one of the best. After Towns has makeup and moisturizer applied, he disappears with Akway for the aforementioned freshen-up. The shoot, which is taking place in an unassuming studio in Northeast Minneapolis, is running late because Timberwolves practice ran late. Williams is already worrying that he’s going to miss his flight back to Los Angeles, but this is the price of perfection. During the down time, I ask Yang how he prepares for a photo shoot like this. Capturing personalities is at the heart of the shoot, Yang said. With Towns, Yang said he already felt like he knew him well because of “thoughtful interviews” he had read and seen. “When I found out it was Karl, I said, ‘Awesome. I know he’s going to be really great,’” Yang said. More than two hours after the shoot was scheduled to begin, it begins. Towns drops down and does a bunch of push-ups. I ask if that’s to make his biceps look better, and he smiles and nods. Then he’s lost in a world of basketballs, clouds and trees. Yang clicks away for several minutes, giving instructions along the way. When that part of the shoot is finished, Towns wanders over to the computer where photo editors are getting an early look at the in-progress shots. Towns takes several pictures of the images on the screen to post later on Instagram. They move on to the next set, with Towns still in uniform. He’s asked to dribble, and he executes some fanciness off his elbow. “I’m crazy enough to do that in a game,” Towns quips. He seems at ease but self-aware at the same time. The production team tries to get him to dance. “I’m not going to dance on camera,” Towns says, laughing. Later, he dances on camera. Then it’s time for the first of multiple wardrobe changes. Williams, who by now has missed his flight, selects a jacket, white top, jeans and white Nikes for Towns. Towns looks good and fresh before adding the finishing touch: a necklace that Williams was wearing. Every element has a specific function, even if the end result is just a few pictures — just like every jump shot over the summer has a purpose, even if the end result is just one critical basket.